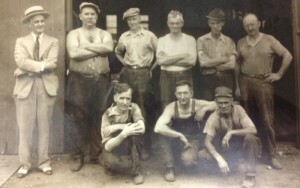 In 1920, Ward Huston (far left in photo) raised $33,800 to start Xenia Foundry at the current location in Xenia, Ohio. Soon after, the first gray iron castings were poured for a growing industrial market in the roaring twenties. The Great Depression took a toll on all manufacturing, but the Foundry survived. By the late 1940’s, business was on an upswing and Xenia Foundry added production space, people, and new equipment. The experimental pouring of ductile iron was done in 1962. In 1974, a devastating tornado hit Xenia Foundry and the surrounding area. The destruction was extensive and rebuilding took 5-1/2 months to complete. Loyal employees, customers, and suppliers were steadfast in their support. During the 1980’s, greensand molding capacity increased and electric coreless induction melting was installed. Tom Huston, second generation owner, retired and son Bob Huston took over the operation. NoBake (airset) coremaking began in 1992 and soon after, nobake moldmaking commenced. By 2000, Xenia Foundry was producing about 1500 tons of gray and ductile iron castings annually in a 42,000 sq.ft. facility. In 2008, Aleks Huston became the 4th generation of the Huston family to manage Xenia Foundry. A major installation of NoBake molding and material handling equipment was undertaken in 2009. Today, Xenia Foundry is a premier small jobbing foundry producing quality iron castings for specialty equipment manufacturers.